Thornwood Designs is run by Paul Procter and family, supplying top quality Woodturning products to shops, galleries, interior designers and individual customers for over 20 years. 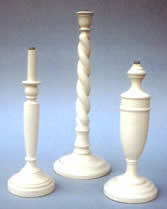 We specialise in making wooden lamps, artistic bowls and Garden Accessories. Visit the online Shop, where a wide variety of items can be purchased immediately. Please enjoy your browse and get in touch soon. Take a look at our wide range of handmade lamps and choose a style to suit your interior design. You will find a blend of traditional and contemporary lamps, handcrafted mainly from English and European timbers with a choice of finishes including hand painted. If you prefer the natural look, view our distinctive character lamps. Paul likes to turn simple well-proportioned shapes. Most of the bowls in this section are gallery pieces made from burr woods. There are also bowls specially designed to display wooden fruit.